It's not easy to entrust the care of a loved one to anyone other than yourself. Yet sometimes it's best for everyone involved. It's best for your loved ones as their physical needs and dependence on you becomes greater, and it's best for you as additional support is needed. Sometimes the need to find help is sudden, such as the result of an accident or illness. At other times, the decision comes after months or years of a slow progressing decline in health. Your challenge now is to select the best living arrangements for your loved one. A new home where individual, physical and emotional needs are tended to professionally, and where respect for the personal dignity of each patient is held in the highest regard. 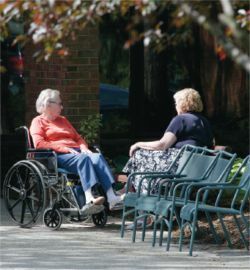 Patients admitted to our skilled nursing unit for long term care may be in semi-acute states necessitating continuing observation, assistance and intervention by a licensed nurse, or require regular diagnostic studies to determine levels of stability. Patients with a continuing need for skilled nursing procedures are also candidates for admission to the skilled nursing unit.